I have only been blogging for 3 months and I do not consider myself successful or expert by any stretch of the imagination. However, I have learned many things about what it takes to be a blogger. It took me a few months to get a handle on it, so this is about providing information for other people to jump-start their own blogging efforts. This post details how to use the features of a blog site, promote yourself and provide content that people are interested in. There are a number of blog site providers out there, I started with Tumblr which did not meet my needs as a technical blogger, now my preference is WordPress because they have many more customisations and monitoring tools for you to use. Many long-term and successful bloggers pay a provider to host their sites (greater creative control for advertising and banners) or host it on their own infrastructure. 1. Dashboard – Administrator control panel. Access it from https://blogname.wordpress.com/wp-admin/. 2. Domain name – you can stick with the free blogname.wordpress.com URL or register your own domain name through WordPress (approximately US$25/year). 3. Theme – this is the equivalent of a Microsoft Word template, it defines the appearance of your blog (font, colours, layout). You have to select a free (limited options) or paid (fully customisable) Theme. Configure it from: Dashboard, Appearance, Themes. 4. Site Title – Name of your site. Configure it from: Dashboard, Settings, General. 5. Tagline – Short description of what your site is about. Configure it from: Dashboard, Settings, General. 6. Header – Custom logo that appears at the top of your blog. Configure it from: Dashboard, Appearance, Customise, Header, Add new image. 7. Blog Picture/Icon – Miniature version of your logo that acts as your avatar. Configure it from: Dashboard, Settings, General. 8. Posts – Each subject that you blog about is a “Post”. Access it from: Dashboard, Posts. 9. Media – Files (Video, Audio, Images, Documents, etc.) that you want people to be able to view and download by inserting into each post. Access it from: Dashboard, Media. 10. Categories – Like “folders”, it allows you to group “Posts” with a common name. Categories are then listed on the “Menu”. Configure it from: Dashboard, Posts, Categories. 11. Tags – Key words from each blog post that you attach to the article, this then adds to your “Tag Cloud”. Configure it from: Dashboard, Posts, Tag section of each post. 12. Pages – Use this for your “About” page. Configure it from: Dashboard, Pages. 13. Comments – Allows your readers to provide feedback on a particular article. Access it from: Dashboard, Comments. 14. Menus – Provides a hierarchical listing across the top of your blog. Allows people filter to “Categories”, “Pages” or “Links” of interest. Configure it from: Dashboard, Appearance, Menus. “Blog-Roll” Widget – “Links” Widget that is customised by “Link Category”. “Twitter” Widget – Customised with a “Widget ID” that you setup on your Twitter account (via Twitter, Settings, Widget). 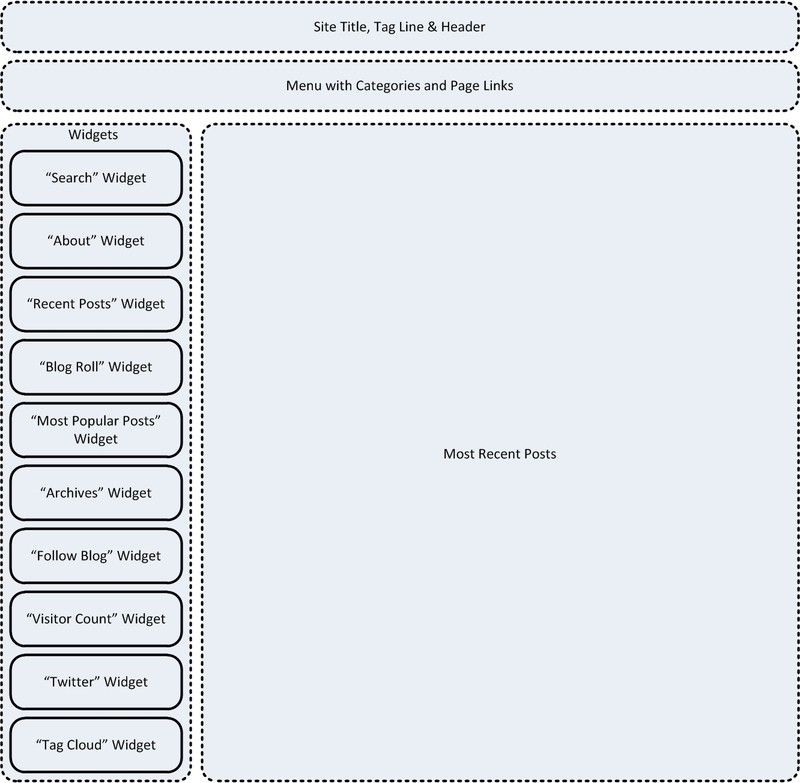 “Tag Cloud” Widget – – Most common tags increase in font size, allowing the reader to see what you most commonly blog about. 16. Links – Create a list of URLs and then list them in your “Blog Roll”. Configure it from: Dashboard, Links. 17. Settings – Area where you customise your blog site. Configure it from: Dashboard, Settings. 18. Tools – “Export” feature allows you to take a manual backup of your site (XML). Configure it from: Dashboard, Tools. 19. Users – Allows you to collaborate with other authors on the one site via multiple accounts. Configure it from: Dashboard, Users. 20. The “Continue reading” button – Allows you to provide an introduction with a “More” page break, highlighted in the image below. Tweeting your blog posts links with an appropriate hash-tag that will pique the interest of your target audience. Interested people will click the link and you will start to grow your following. Similar to Twitter, you can also post your blog links to LinkedIn. If you already have a large number of professional connections within your “industry”, then you already have a target audience to leverage. Pinging creates a “Ping-back” which provides a link to your blog for readers of the popular site you referenced. Contact “blogging aggregators” to see if they will list your blog and stream your RSS feed to their website and Twitter account. For example, VMware Planet V12n does an excellent job of this for technology blogging. Watch-out for “Blogger” passes to industry events in your area of expertise. By attending events and blogging about them, you will increase your readership. Present at local forums and industry events. Nominate yourself as a guest for industry podcasts. Sponsor a podcast or competition, the contribution does not have to be a lot of money, it can also be your time and experience (eg. mentoring). The most important characteristic of a successful blog, is sustainability and dedication. It takes at least two years of regular blogging to make a name for yourself. So set a realistic goal of posting frequency, maybe once per week and commit to 52 posts per year. Use the “draft” feature of WordPress to create blog ideas that you can develop and post at a later date. What type of content interests people? One of the early mistakes I made was to blog about sophisticated designs that not many people were interested in. Once I started blogging about “operator” and “administrator” subjects, my view-rate increased. Whatever your blog interest is, try to write about what is popular and in demand. Then again, if you are using your blog site as a personal journal, who cares how many views you get. Thanks to Craig Kilborn at VMFocus.com for a lot of these tips.